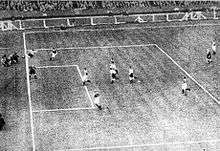 The 1932 FA Cup Final was contested by Newcastle United and Arsenal at Wembley Stadium in what became known as the "Over The Line" final. Newcastle won 2–1, both of their goals scored by Jack Allen. Arsenal had led 1–0 with a Bob John goal, but Newcastle's equaliser came after a long ball that had appeared to foul over the goal line, and was put back into action for a goal kick. Newcastle winger Jimmy Richardson crossed the ball back into the field and Jack Allen levelled the match for the Magpies. The referee ruled that the ball had not gone out of play, but photographic evidence later showed that the ball had crossed the line; the goal stood. Allen scored again in the second half to win the match 2–1. ↑ "FA Cup Final 1932". FA Cup History (unofficial site). Retrieved 27 June 2006.